In Ayurveda, the aim is to live in harmony with one’s self and our environment so understanding the laws of nature as explained in Ayurveda will help you find greater balance in your health and life. Each one of us has a different make-up of the above three Doshas but in winter it is known that Kapha is predominate and this commonly translates as excess mucus. With Kapha there is a tendency for stagnation and therefore stimulation is good. A basic principle of Ayurveda is “like increases like”, so if there is a predominance of a quality such as Kapha in winter, the opposite qualities are used to reduce it. In winter that means making sure you stay warm, eating food that is light and easy to digest, staying active and minimising food and activities that are heavy and moist. There are some people who do not mind the cold and you may even see them wearing just a t-shirts in winter. It is likely that these people will dislike the heat of summer as they have a lot of Pitta. If you are not Pitta dominate then it is time to find ways to help you stay warm. Avoid cold, heavy damp foods such as ice cream, yogurt and cold drinks. During winter, even room temperature water can be a bit to cooling for the digestive system so add some boiling water to make it warm. 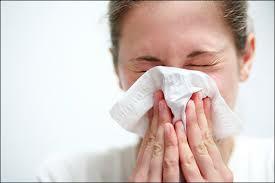 A build-up of mucus is often associated with poor digestion caused by overeating or eating an excess of heavy foods. An occasional day of light fasting is ideal – maybe some vegetable soup. Drink hot beverages – hot water by itself is great or ginger tea is a great way to prevent mucus build-up and maintain a strong digestive fire. Herbal teas are also great. Keep the mouth and tonsils clean by scrapping the tongue in the morning before eating and drinking, and gargling with half a teaspoon salty warm water before bed. It may sound obvious but dress warmly when going out. Keep the feet and head warm to avoid loss of heat and even try wearing some warming colours like red, black and orange.